In Zurich, the quest for something cool ends at the nearest badi. It is hard not to feel extremely self-satisfied on a late summer afternoon in Zurich, relaxing in the sun. Not only because you perhaps just closed a multibillion euro-Swiss franc M&A deal but because you know that you live in a modern fairy-tale paradise of a city. Where else can you lie out suntanning on a weathered wooden deck, dark aquamarine lake sloshing under you, glass of rosé at your side, steps away from your office in the heart of the city? 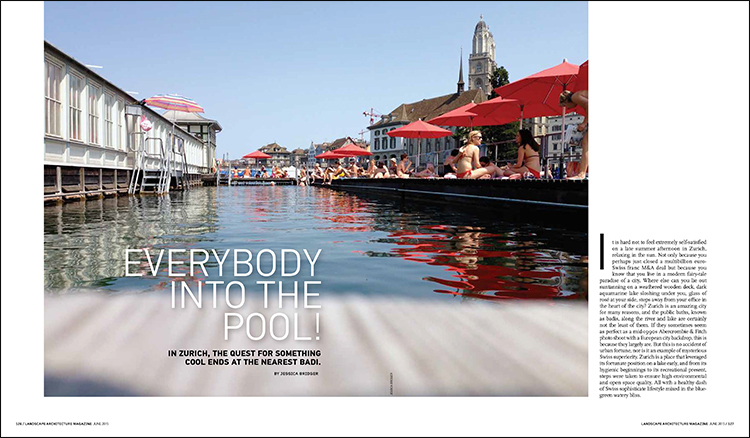 Zurich is an amazing city for many reasons, and the public baths, known as badis, along the river and lake are certainly not the least of them. If they sometimes seem as perfect as a mid-1990s Abercrombie & Fitch photo shoot with a European city backdrop, this is because they largely are. But this is no accident of urban fortune, nor is it an example of mysterious Swiss superiority. Zurich is a place that leveraged its fortunate position on a lake early, and from its hygienic beginnings to its recreational present, steps were taken to ensure high environmental and open space quality. All with a healthy dash of Swiss sophisticate lifestyle mixed in the blue-green watery bliss.